Beautiful stereoview photograph of the Santa Barbara State Street - Views of Santa Barbara and Vicinity taken by Hayward and Muzzall around 1875. This item is over 137 years old. 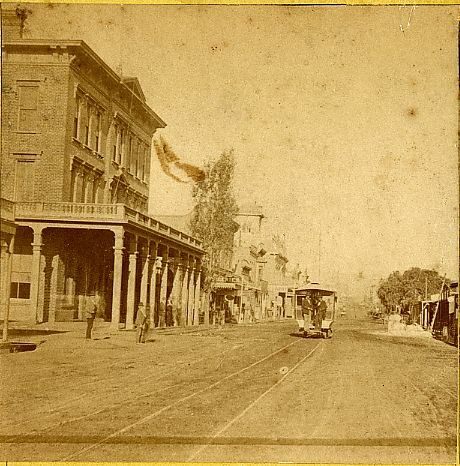 Hayward and Muzzall’s real photo stereoview image of a horse drawn trolley going up State Street in Santa Barbara, California. This is view No. 23. A dentist sign, supply store and millinery store can be seen. This is a flat mount view on yellow card. Hayward & Muzzall took pictures in Santa Barbara from 1874 to 1883.